Good Vibrations Key To Insect Communication For some insects, sound waves or vibrations are the real social media — high-speed rumbles sent through the air and along leaf stems to help the bugs claim territory, send warnings and find mates. Male treehoppers make their abdomens thrum like tuning forks to transmit very particular vibrating signals that travel down their legs and along leaf stems to other bugs — male and female. But you don't have to weigh a ton to rumble. In fact, you don't have to be bigger than a pea. Consider, for example, the treehopper, a curious little sap-sucking insect that lives on the stems of leaves. 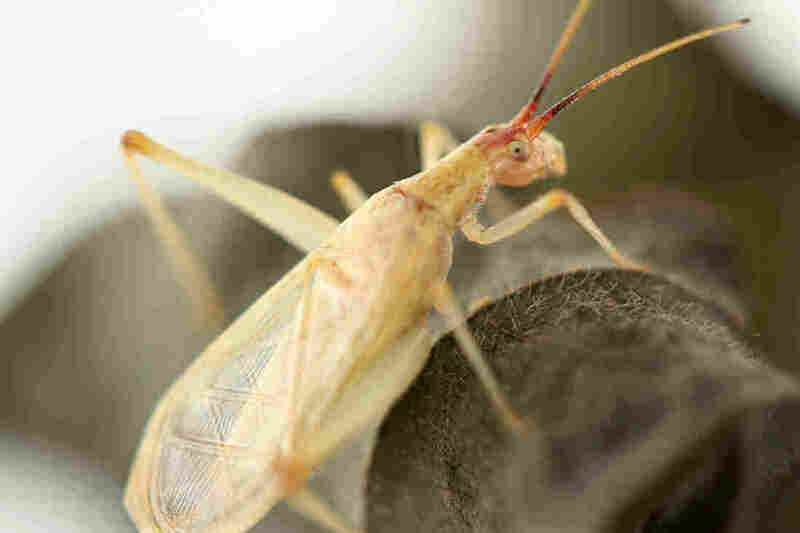 Or the tree cricket, which communicates by rubbing together toothlike structures on its wings, the way you might draw your thumb across the teeth of a comb. University of Missouri biologist Rex Cocroft has spent much of his career listening closely to treehoppers. In 1999, a team from NPR's Radio Expeditions program rendezvoused with Cocroft at a locust tree in a backyard in Virginia. Soft-spoken and bespectacled, he was pressing a phonograph needle up against the stem of a leaf. "I'm just trying to get a good contact here," he said at the time. "Mind you, this is not in the manufacturer's instructions for these phonograph cartridges." But then, there's no guidebook for listening to treehoppers. Cocroft created his own. He knew that needles in those cartridges are exquisitely sensitive to vibration. So he connected a wire from the cartridge through an amplifier to his headphones. This is what he heard. "All the signals that you are hearing are produced by males," Cocroft explained. They do it by vibrating their abdomens to make a wide assortment of bizarre sounds. It works like this: The insect uses muscles in its thorax and abdomen to shake the abdomen, which vibrates "rather like a tuning fork," Cocroft said. 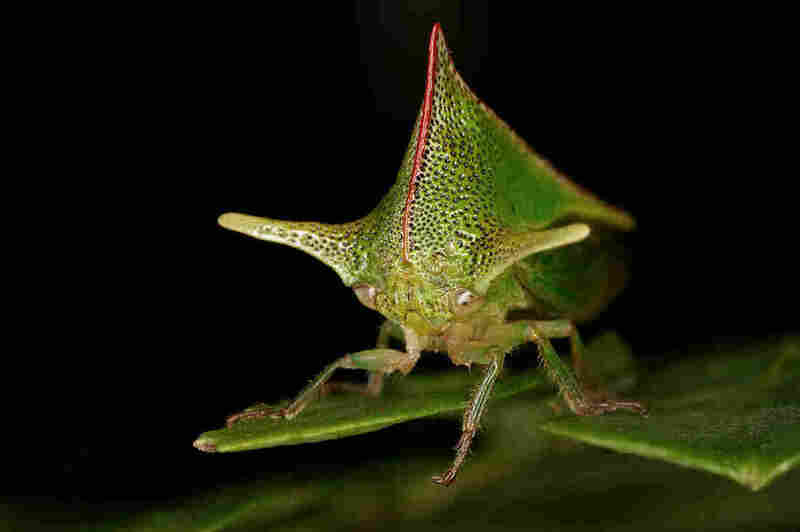 "These vibrations are transmitted to the stem through the insect's legs, and then travel out in both directions along the stem, where they can be picked up by any other treehopper within a meter, or so, on the same plant." There is almost no airborne sound produced with these vibrational signals, Cocroft explained. "If a treehopper were to stand on your finger and produce a signal, you would feel the vibration but hear no sound." It's the phonograph needle and cartridge that pick up the vibration of the plant stem — and transform it into what we hear as sound in the recordings. But the treehoppers are picking up the signals via very sensitive vibration sensors in their legs. Some signals, not surprisingly, seem to be aimed at attracting females, Cocroft said. And some are aimed at other males. "So we're hearing purring, bdddddrrrr sounds," Cocroft explained — "sounds that males give ... when two males meet each other, when they are mate-searching on a branch." Normally, a person couldn't hear any of this, because the sound travels along the stem, inside it. And that's how other treehoppers detect it. So, how did such a weird insect telegraph evolve? Well, Cocroft said treehoppers, like many insects, have very sensitive legs. And they stand around on stems, which are good at transmitting vibrations. So they just used what nature gave them to communicate with each other. As social animals, that's what they need to thrive, said Cocroft. "They have so many different forms of social behavior and grouping," he explained. "And once you have animals living in groups, then you have all sorts of interesting possibilities for communication." Such as, for example, treehopper scouts that tap out a signal to others that there's a predator nearby. Technology helped scientists like Cocroft reveal this hidden vibrational world — tech like phonograph needles, and devices called accelerometers that measure vibration. His work helped usher in a new generation of insect eavesdroppers — including Laurel Symes, an evolutionary biologist now at Dartmouth College, who has spent much of her professional life studying crickets. 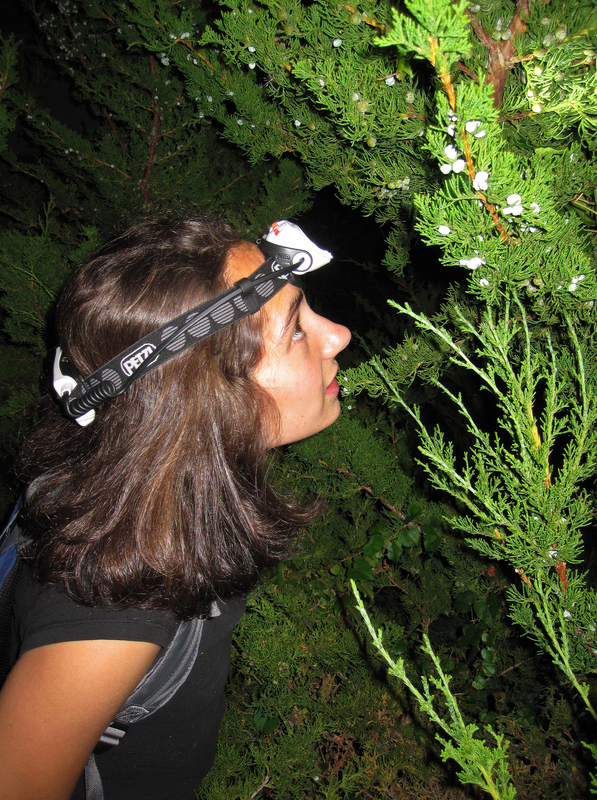 Unlike Cocroft, Symes tunes into vibrations we can hear — from male tree crickets. "If you look closely at one of the wings," she says, "it has a whole bunch of tiny teeth on it. And that rubs against the vein on the other wing — and that causes the whole wing to vibrate, sort of like a drumhead would." When a tree cricket rubs its wings together, tiny features of the wing rub against each other to create a species-specific chirp. Tree crickets don't seem to have as big a vocabulary as treehoppers do. What they do have is a remarkable ability to discriminate tiny differences in sound frequency, with acuity worthy of a concert violinist. The females listen carefully. And the reason? Well, in the deep woods, you'll hear all sorts of crickets chirping. Those are the males of numerous species, all saying, "Come and get me." To us, they sound pretty much the same. But the sounds actually are different. The speed at which they rub their wings together — the pulse rate — varies from species to species. Symes discovered that females pick up on that. "They've evolved to be very, very good at recognizing the exact thing they are looking for," she says: the sound of a potential mate from their own species. There's a good reason to very picky, Symes says: "If you don't get it right, you lose." If you pick the wrong species of male to mate with, she says, you won't make little crickets. She actually rigged up a clever sound experiment to test how good the females are at detecting the right chirp. Symes synthesized the sounds made by various male crickets on a computer — each was identical to the natural sound it was mimicking — and then she played it back to two species of females through a speaker. Here's a male cricket chirp at 43 pulses per second. The females of one species hustled over to the loudspeakers when they heard that sound, looking for a mate. The other females? Meh, not interested. Then Symes used a different chirp — at 51 pulses per second, it's just eight pulses a second faster than the first one. It's so close in speed to the previous one that most human listeners can't hear the difference. But the female crickets of the second species — the ones that ignored the first sound — got all romantic with the speaker. What's happening, Symes says, is that crickets (there are about 140 species in North America alone) have divided up the sound spectrum into sonic niches. Each species has its own frequency, like a radio station. And they manage this highly specialized communication with a brain the size of a pinhead. Laurel Symes on the hunt for crickets. "One of the things that makes them cool," says Symes, "is that they have really simple sensory systems — yet they parse this really complex world." It took Symes years, and many nights in weird places, to decipher what was happening. She had to go to where the crickets live and record them — like up a tree on the Mexican border, where border patrol agents wondered just what the heck she was doing. "You're partway up a tree," she recalls, "and the vehicle pulls up and stops and flips on a light — 'What're you doing out here tonight, ma'am?' and 'Oh, I'm just collecting crickets.' They believed me. That's what amazed me." Now she's so tuned into the cricket world that she thinks — and sometimes sounds — like them. We asked her to imitate one species of cricket. Yes, Symes can do 60 pulses a second herself, just from memory. She says 60 pulses is a lot like a humming refrigerator. In fact, she's always listening to vibrations, whether she wants to or not: crickets, fans, air conditioners. "We think that we know what's going on out there," she says, "and we're [only] getting this tiny slice of all of the sound in the world." Cocroft feels the same way. Today he says he dreams about wiring up the outdoors and amplifying it, and just drifting through it — ears wide open. He says most of this sonic world still remains to be discovered. "It's a very intense world, and so little of it, really, has ever been listened to," he says. "It's possible still for anyone to go out into a weedy field or roadside and tap into those plants — and hear very interesting sounds that no one has ever heard before." Sounds that have been rounded and shaped by millions of years of evolution, and the struggle to survive.